Camalie Vineyards is located 6 miles west of Napa on Mt. 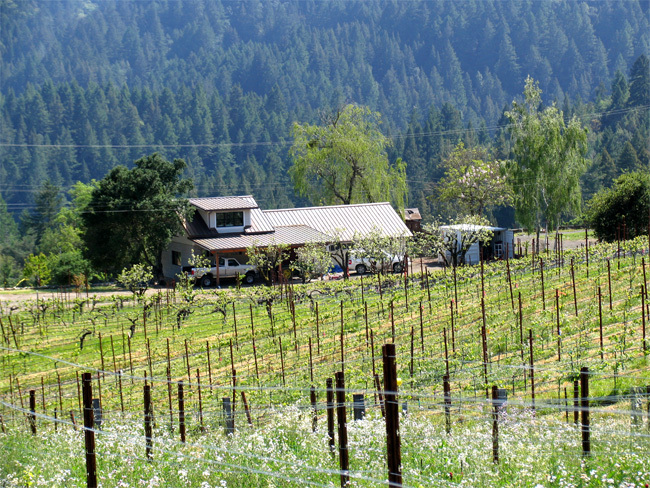 Veeder in the Mayacamas mountain range at the center of the Mt. Veeder Appellation. It consists of 4.4 acres of vineyards and 18 acres of forest. The land that Camalie Vineyards comprises used to be part of the ocean bottom. The soil is primarily clay. In many places the soil is 30 ft. deep on top of sandstone bedrock. Because of all this soil the earth here is always moving. The Mayacamas are known as the "walking mountains". They take a step every year as the soil gets drenched with 40 inches of rain in the winter and then proceeds to dry out during the 6 months of Summer and Fall when they see no rain at all. The deep clay soils hold a great deal of moisture throughout the growing season enabling the vines to survive with minimal irrigation once established. The roots reach depths of 5-6 feet but are mostly found 2-3 feet down. Optimal vitaculture still calls for significant irrigation. We use about 35 gallons of water per vine over the course of a growing season. The first settlers on this land were the Simmons family around 1860 although we also have reports that they owned it as recently as 1974. Need to do more research here. They cleared the land and planted a plum orchard which supplied plums to Sunkist. A number of bearing plumb trees can still be found around the property. They dug a well by hand 25 ft. deep, lining it with stacked rocks at the site of a spring which supplied all the water they needed. 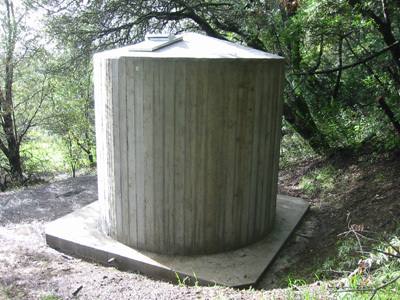 This well is still intact and supplies 20% of the water we use for irrigation, about 55,000 gallons a year. Various other people owned the property over the years. Bill and Susan Wright eventually ended up with the property around 1975 after his brother convinced him to buy the place. It was called Pickle Canyon Vineyards before they bought the place. The 'Wright Brothers' named it Kitty Hawk Vineyards. Bill's brother, John Wright, worked for Anderson Consulting in New York before coming to California. Anderson was hired by Moet and Hennessy to explore their getting into the California Wine business. John Wright was assigned to the M&H account and did consulting for them eventually recommending their purchases of land in Napa. M&H hired John to manage their aquisitions and start up Domaine Chandon in California and as part of his compensation he ended up with the parcel adjacent to Camalie Vineyards to the North. Sometime in here he married Renate. The old cinder block building with our shop and agricultural equipment storage was the office where John managed most of the Domaine Chandon original start-up. John and a neighbor Michael Jones who was living on the Domaine Chandon property East of Kitty Hawk Vineyards made still red wines in this building. It includes a closet sized wine cellar. We made 5 barrels of wine in this garage in 2005 when we had an unexpected bumper crop of grapes in the second year after planting. Around 1975 John convinced his brother Bill who was retiring from the CIA to buy the property. Bill and Suzy added a redwood hot tub to the old House and had numerous parties there which visiting Mt. Veeder old timers like Randle Johnson and James Konrad, frequently tell us about. The Wright brothers planted the vineyard with Cabernet Sauvignon grapes in 1975 on St. George root stock, a very vigorous phyloxera tolerant rootstock which has enabled them to survive without irrigation for more than half their 34 year lives. Suzy Wright eventually got tired of the remote living and in 1985 they sold the Kitty Hawk Vineyards to Dr. Woo and moved down into the valley. Thoracic surgeon Dr. Russell Woo contracted the farming of the grapes for 7 years until the yield dropped below an economically viable level. Dr. Woo used the property primarily as a retreat from his busy San Francisco medical practice. He retained the name Kitty Hawk Vineyards. In November of 2000 My wife Cindy and I, purchased the property from Dr. Woo and his wife and renamed it Camalie Vineyards which is a name formed from our kids names, Cameron and Natalie. We made wine from the limited grapes that were surviving on their own in 2001 with surprising success and started the process of developing water supplies and replanting the vineyard. We kept the best half acre of the old vines to practice winemaking and pulled out the remaining 3.5 acres of old vines in the winter of 2001/2002. The old vines were burned in huge bonfires and all of the wire of the old trellising hauled away for recycling. This was before it became fashionable to sequester carbon. We engaged an architect to begin work on a design for a new home in 2001 and saw first plans in early 2002. We sat on the plans for a year and just couldn't get excited enough to start the project. In the summer of 2002 we installed our county approved erosion control plan and prepared the vineyard for replanting. This involved putting in drainage pipe and cultivating. South Vineyard Ready for replant after erosion control put in. In late winter 2001/2002 we laid out the new vineyard, marking each plant location with a plastic knife. Then end posts were pounded into place. At this point the irrigation submains were trenched in and risers placed for each row. Then the highway stakes were pounded in and wire run for cordons and irrigation hose. Training stakes were placed and clipped to the cordon wires. Irrigation hose was run and clipped to the irrigation wire. Holes were punched in the irrigation hose and drippers installed. To hold the soil in place through the winter of 2002/2003 we planted a cover crop and applied a layer of hay to hold the soil in place while the cover crop had a chance to take root. In the spring of 2003 we set the new vines in place. Ramon Pulido, Vineyard Manager on right planting March 2003. We were very fortunate to find vineyard manager Ramon Pulido who has guided us through the process of growing grapes and replanting the vineyard. He has been extremely successful in getting the yields up. In 2001 before he got involved the yield for the whole 4 acres was 3/4 ton. The following year with a little fertilizer and water we achieved 3/4 ton from just the 1/3 acre of vines we had saved for posterity. In 2003 the yield further increased to 1 ton in spite of losing another dozen of the 325 vines. 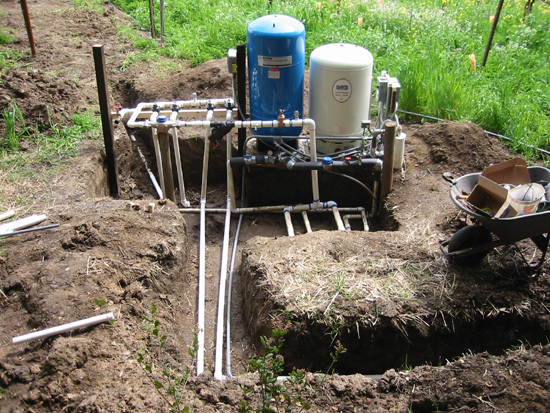 In 2003 we brought 2 new wells online, installed an irrigation system including a 10K gallon water tank and fertilizer insertion capability and automatic timer. One year old replanted vineyard January 2004 , 360 degree panorama. The winemaking has had an interesting evolution. In 2001 we hacked through the blackberries to pick the grapes that had grown in the vineyard despite 7 years of complete neglect. The Advanced Winemaking class at Napa Valley College gave us enough knowledge as we made Pinot Noir in class to make cabernet that year 2 weeks behind the winemaking in class. This was just in time learning. 2001 I enlisted two of my neighbors in this risky venture to make a barrel and a half of Cab never having made wine before except for that bottle I made from some Welches grape juice and red star yeast when I was 12. Part of our success was some significant planning which was enabled by my retirement from Intel in the Spring of 2001. The original Winemaking Proposal was an engineer's approach to a new project. No time for apprenticeship here. Neighbor's Gary Bacon and Tim Guilford were enlisted and the Forest Ave. Wine Coop was born. In 2002 the vineyard had been ripped out except for the old guys but we wanted to make more wine so we bought grapes from our neighbor Domaine Chandon who had started planting cab a couple years prior. We were very lucky to get the first crop from their 2.5 year old French clones for only $2.5K/ton. These grapes made the fabled 2002 barrel WC5 which has been consistently our best liked wine in blind tastings against anything. In 2003 I got sloppy with my feeding of the yeast and ended up with sulfides, then mercaptans and finally disulfides all of which smelled very bad. I ended up dumping 1.5 barrels of this wine down the drain. Fortunately the co-op wine didn't have this problem although the grapes were picked early and this wine tends to be fairly vegetative. Cindy retired from Intel this year. In 2004 we were still not picking ripe enough. We bought grapes from Rubissow and fed the yeast diligently avoiding any sulfide problems. All of the wine this year was made in Palo Alto. In 2004 we hired M. Dean Jones to design a remodeling of the garage which was constructed in the summer of 2005. We also began excavation of a 1500 sq. ft. cave in the summer of 2005. The plans for the home by the first architect we engaged just didn't excite us enough to justify the resources required to make that design happen. Something was missing. The idea of building a green home was the result of Cindy's reading and discovery of this movement. Cindy found Arkin-Tilt architects at a sustainable living conference in Hopland and we engaged them to design a new "green" home for the site. As we were redeveloping the vineyard and garage and putting in a cave it was clear to us that we were making some significant changes to the environment. We were sensitive to this and wanted to minimize our impact, living in a way that wouldn't change the beautiful environment there long term. To avoid changing the global environment we decided to build a home that would not use any fossil fuels. Solar energy and dead wood from the 18 acres of forest on the property were to be the energy sources for the home. Solar would be our first choice to minimize our carbon footprint. We decided to stop the policy of burning our prunings again to reduce our carbon footprint. We opted for a smaller home integrated well in shape and placement with the hillside. In April 2005 we had first plans for the home from Arkin Tilt. 2005 was the "Crush amid Chaos". The chaos was the result of having to demolish the old house in the midst of harvesting a huge unexpected crop (4 tons) for a two year old vineyard, and making wine from it. We couldn't let this awesome first crop go to waste so we expanded the co-op in Palo Alto to 12 members/4 barrels and started up a second one in Napa which ended up making 5.5 barrels. This was a wise decision because all of the wine we made that year is awesome. Samples from the barrels helped us get three offers for the grapes the next year. We held the harvest party on the dirt floor inside the cave with Christmas lights strung up and down the tunnel. We thought we were close enough to completing our plans and getting them approved that we felt comfortable demolishing the old house in the fall of 2005. It allowed us to do some grading work in preparation for the new home's foundation. As it turned out we weren't that far along. It wasn't until March of 2006 that the plans were ready for submission to the county at which point we found out that the queue for approval was 12-14 weeks long. It ended up taking us until 8/21/06 to get them approved, almost 5 months. We missed most of the 2006 construction season because of this delay but, were able to get the foundation largely done that fall. Light rains that winter allowed us to make good progress on getting the Tri-D panels up and ready for shotcrete the following Spring. In 2006 the vineyard yield doubled to 8 tons and this time we found a buyer, in fact 3 offers thanks to our good neighbors' referrals. We scaled back the coop size and had one of our lowest stress crushes yet except for the rodent from hell that ate the fuel injector wiring harness on my F350 Pickup the day before harvest. David Provost saved the day by lending us his truck. The swimming pool was complete in time for swimming on the 4th of July, 2007.Construction continued throughout 2007 and 2008 finishing up around harvest of 2008, three years from the date we demolished the old home. This was about a half year longer than anticipated and significantly over budget. In 2007 the yield doubled again to 17 tons this time almost reaching 4 tons/acre which is very rare on Mt. Veeder. Our winery customer complained about the unexpected volume but, accepted it in the end. Rains before harvest suppressed the brix levels but, the last 3.5 tons to go were at 29.7 Brix. The cave was complete except for doors so we moved the co-op to Napa. The Merlot yield was very high producing almost 2 barrels of wine while the Carmenere fruit set was poor producing only a quarter barrel of wine from the same number of vines as the Merlot. Our wireless soil moisture sensing network was critical as the previous winter's rainfall was half of normal and we had to truck water for irrigation at the end of the season. In 2008 we had frost in the spring and yield fell off significantly back to 9 tons. We joined the Mt. Veeder Appellation Council and Mark became its Vice President in 2008. We have since hosted several Council meetings at the new home and made numerous contributions to the new Appellation Website. In 2009 we have for the first time been able to enjoy the new home with all of the development done except for some landscaping. Our focus was simple; raise our kids, grow the best grapes and make the best wine with the best of friends in a way that respects this beautiful spot on Mt. Veeder and the planet. Set an example for others if we can. In 2015 we finished the bulk of raising our kids as Natalie went off to school and with Cindy's loss of interest in wine we have decided to part company as of this April 2016. I'm now living full time at Camalie and hope to be able to continue doing so but, only time will tell. Glista and Tim, Best of Friends. Walking up to the front door of the old residence. It was demolished in Oct of 2005 to make way for a new home. Upper Vineyard of 25 year old Cabernet Sauvignon Vines. Also the Garage/Workshop/Ag shed and the indispensable 1984 Toyota Pickup truck. The newly roofed cistern/well and our vegetable garden. Summer 2002. Acknowledgements: Special thanks to Randle Johnson and Mike Morris for filling us in on the history of this parcel before it is lost. More Mt. Veeder History Reprinted below so it doesn't get lost with the next update of the NorthBay biz website. For the second installment of our Hidden Gems series, NorthBay biz travels to Napa Valley’s beautiful, remote and forested Mt. Veeder. Picture yourself driving along the twists and turns of a mountain highway, with a canopy of redwood, bay and madrone trees alongside the road. Overhead, dapples of sunlight beam through the branches so the landscape seems to sparkle. A clearing reveals vineyard rows that reach up the mountainside, surrounded by trees. The vineyards here aren’t contiguous. They’re individualistic and on varied slopes, separated by forests and time. Each has a distinct personality—much like the people to whom they belong. Mt. Veeder is a place where individuals are intent on expressing their unique characteristics. Its remote feel attracts artists, recluses and, of course, winegrowers. Many are separated by acres of land, but all share a common goal: to grow top-quality grapes that make the finest wine possible. The mountain is 25 square miles (15,000 acres) in size, and is the largest subappellation that’s entirely within the larger Napa Valley AVA. It stretches from the Carneros region, just east of the Sonoma County line, to the north as far as Glen Ellen and Oakville. Only 1,000 acres are planted to vineyards. The rest is made up of steep slopes, family homes and getaways, wild lands, hummingbirds, dragonflies and a history that’s equally as rich as the deep, intense wine that’s the true expression of Mt. Veeder. Its history, however, is largely unknown, even though it was one of the first areas in Napa to be cultivated for winemaking. (Prior to that, the Coastal Miwok Indians inhabited the area.) The first wine produced is credited to Stalham Wing, who exhibited several bottles at the Napa County Fair in 1864. Mt. 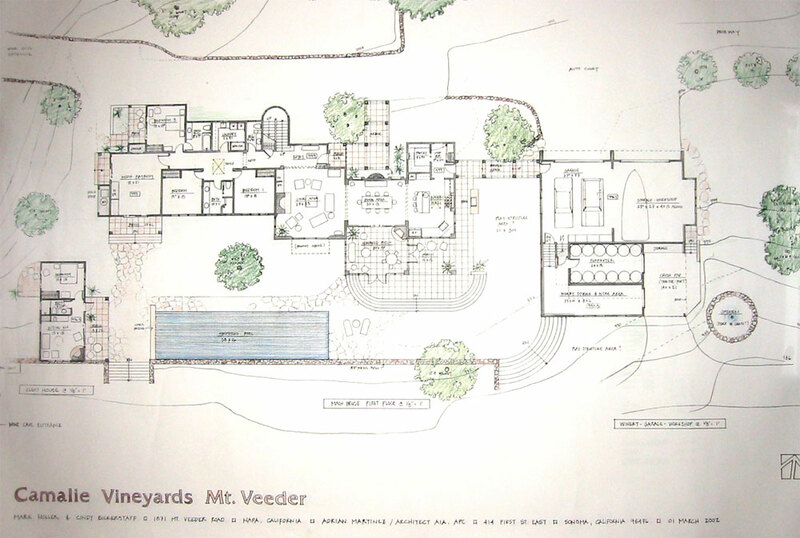 Veeder’s Wing Canyon area, where his winery was located, is named for him. If you drive up Redwood Road, you’ll see where some of Napa’s earliest wineries operated, including Hein Winery, which was the first commercial producer on the mountain. Today’s Hess Collection stands next to where Wing’s property was, and was originally owned by H. Hudeman, then Rudolph Jordan (credited as one of the first winemakers—maybe even the very first—to use pure yeast to control fermentation), Theodore Gier (who built a three-story stone winery there, and was a major contributor to the increased recognition of California wines) and finally the Christian Brothers, whose Brother John and Brother Timothy were world-renowned winemasters. The Nicholas Streich family built a small winery nearby in 1884, later named Castle Rock (after a rock formation on the property) and now owned by Yates Family Vineyards. Near there, you’ll find the original Fisher Winery, now known as Mayacamas Winery and owned by the Travers family. Early visitors to the area called it Napa Redwoods, and were as attracted to its many health resorts as they were to its wine. The name was replaced over time, to reflect that of P.V. Veeder, a Presbyterian minister who spent much of his time in the area. It was H. Hudemann’s botanical garden and resort, Lotus Pond, which first drew visitors to the current-day Hess property. There’s still a 70-foot-tall monkey tree, stone fountains, irrigation and a stone wine cellar from that era. “There have been four generations of winemakers on Mt. Veeder,” says Randle Johnson, consulting winemaker at The Hess Collection, who’s been working on the mountain since 1977 (as cellar master at Mayacamas) and began as winemaker at Hess in 1983, when owner Donald Hess decided to produce his own wine at the encouragement of Robert Mondavi. Prior to that, Hess had been selling its grapes. “The first [generation] was the German settlers [who grew German varietals such as Riesling]; then post prohibition with the Christian Brothers and Mayacamas Vineyards [1940s/50s]; then in the 1970s to 1990s you saw Hess, Domaine Chandon, Rubissow-Sargent, Kendall Jackson and Robert Craig [among others]. Today’s generation is interested in boutique wine and ultra-micro brands. There’s a new wave of ownership. Some just want to be growers, most do Bordeaux reds and ask $50+ per bottle. “The Germans came up from the South Bay, heralded by Agoston Haraszthy of Buena Vista, who wanted them to come to Sonoma. What he didn’t count on was, they were used to slopes. So they got to Sonoma and went over the hill to Redwood Creek in Napa for steeper terrain,” says Johnson. Turns out, Mt. Veeder’s earliest winemakers chose the area because they’d learned over time that mountain vineyards produce more intense wines and, thus, were worth the extra effort. It was Ernest, Nicholas and Robert Streich who first settled the property where today’s Yates Family Vineyard is located. It was 1881, and the Streichs mainly planted German varietals. They also built a stone winery in 1884 that still stands today, including its original Roman press (one of two in Napa Valley) and housing much of the original equipment: a labeler, a basket press, redwood vats, saws and a horse-pulled tiller among it. Though no longer in use, the winery is a true testament to the history of the area. Perry Yates purchased the property in 1950, and his grandson Michael took it over in 1993. On its 270 acres, 37 are planted with mostly Cabernet Sauvignon, Merlot and Cabernet Franc. Mary Yates is a fourth-generation grapegrower and president of the Mt. Veeder Appellation Council. Her parents, Michael and Lynn Yates, own the winery, and Michael is co-winemaker with Mary’s sister, Whitney Yates Hanes, who’s also vineyard manager. “Come harvest, it’s all hands in the picking,” says Mary. “It’s us and five vineyard workers doing all the work.” They make about 800 cases annually, selling about 80 percent of their grapes. The family started a commercial winery in 1999, originally named Napa Redwoods Estate; with the 2005 vintage, they changed it to Yates Family Vineyard. The winery produces Cabernet Sauvignon, Merlot, Cabernet Franc and Viognier (the first was bottled this past June and will be released this fall). Its Alden-Perry Reserve, a Bordeaux-style blend named after Mary’s grandfather and great-grandfather, is “a true expression of our vineyard.” It exhibits dark fruit and anise on the nose with a hint of smoke, then opens up on the palate with cinnamon spice, pepper and jam. It’s well rounded and its layers linger long after you take a sip. Getting the word out is a main goal of the Mt. Veeder Appellation Council (MVAC). “I remember going with my dad to annual tastings and vineyard seminars when I was a kid,” says Yates. “I wondered why [the council] didn’t do the tastings anymore, so I started things going again. The first meeting was March of 2008 and, since I’d gathered the people together, they told me to head it. Robert Craig agrees. Although his winery is located on Howell Mountain, he has deep roots on Mt. Veeder. Former general manager of The Hess Collection winery, he was an instrumental figure in getting Mt. Veeder’s AVA status recognized. Today, he makes a Cabernet Sauvignon from a vineyard he helped develop there, PymRae, which is at 1,800 feet atop the summit of Mt. Veeder. “The vineyard has typical Mt. Veeder soils: ancient ocean bottom, decomposed sandstone and subsoil that’s really amazing. It’s petrified shale, which is extremely well drained. The terrain is steep. When rain falls, not much water is retained. The roots don’t pick up all the water the vine wants. So the berries’ juice is more concentrated,” says Craig. “I think over the next four or five years, the Mt. Veeder appellation will come into its own. There’s a new group of people there who want to bring it forth as a strong appellation. They want to show people what’s unusual about Mt. Veeder and its wines. “In the old days, everyone was so individual that it was hard to get a consensus. It was like herding cats. Now [MVAC] makes it different. There’s been a Mt. Veeder appellation committee since the mid 1970s, and there was quite a bit of activity again when it was recognized as an AVA in 1990. But it didn’t catch on until recently. The new group is energetic, focused and very businesslike,” says Craig. Another MVAC member is Tom LaTour of LaTour Vineyards. “We’re getting ourselves organized to become well known. Soon, there’ll be signs letting people know when they’re entering and leaving the area. It’s important to make people aware they’re in it. And some day, we’d like to have a Mt. Veeder tasting room in downtown Napa,” he says. Events are an excellent way to spread the word and showcase the wines. An annual “Napa Valley with Altitude” tasting at Ft. Mason in San Francisco (which also includes Diamond Mountain and Spring Mountain) takes place each April, and is a great way to taste the offerings from the area. This year, a Mt. Veeder tasting will take place October 3 at Lakeside Grill in Yountville (3-6 p.m.—visit www.mtveederwines.com for information). “One thing you’ll find in the mountains is, everybody does their own thing,” adds Craig. “The economics of mountain wines are totally different than on the valley floor. It costs more to develop and farm, then the vineyard produces 60 percent of the crop you’d see with the same sized vineyard on the valley floor—but the result is wonderful wine. “This is what I imagined,” says LaTour when asked why he chose Mt. Veeder for his vineyard. “Some may say there’s better dirt in the middle of Oakville, but I don’t think it’s quite as romantic. “We can ripen Cabernet Sauvignon using the whole season,” says Holler, whose Camalie Vineyard is located almost exactly in the center of the appellation. “It’s harvested in October or sometimes into November. It gives a different quality profile. There’s higher concentration and fruit intensity. The wines are inky with smooth tannins.” This effect is due to the mountain’s cooler air and well-drained soils. There’s a longer, slower ripening season. “Mountains have enormous diversity. The valley floor has uniformity. Due to different exposure, soil types and depths, mountain vineyards have more complexity,” says Craig. Craig started his own brand in 1992, and the first Mt. Veeder offering was in 1993 (a Howell Mountain Cabernet and Affinity, which is a proprietary Cabernet blend made mostly for his wine club and for restaurants, were also released that year). He also produces a Sonoma Valley Chardonnay (Durell Vineyard, near Carneros). “We focus on where the grapes come from. I like wines to have a sense of place,” he says. Craig’s 2006 Mt. Veeder Cabernet Sauvignon will be released in September. “It’s the best we’ve made,” he says. “Keith [Emerson, who joined the winery in 2006 as consulting winemaker] has an excellent palate; his wine has more power and polish.” This wine has a blueberry nose, black fruits, a bit of cedar and some mocha. “The fruit is focused with a lot of core concentration, then spreads out from there,” Craig adds. Randle Johnson started at Hess in 1983 and is now a consulting winemaker as well as winemaker for Artezin Wines (heirloom varietals including Petite Sirah and Zinfandel), another Hess Family label, and director of winemaking for Bodega Colomé, a Hess Family property in Argentina. Hess Collection produces about 500,000 cases of wines annually; about 25,000 cases are Mt. Veeder-specific. Hess produces Mt. Veeder Chardonnay, which has tropical notes on the nose, musque characteristics and mineral on the palate with a creamy mouthfeel. Its 19 Block Cuvée, a blend of Cabernet Sauvignon, Malbec, Syrah, Petit Verdot and Cabernet Franc, has bright red fruit with a juicy, lush dark finish. The Mount Veeder/Napa Valley Cabernet Sauvignon is the flagship wine. The first release was a 1983 vintage (a 1982 Reserve was released many years later); most grapes were sold in those days. The current release, a 2006, is smoky and meaty with a dark, masculine character. Specialty grapes grown on the Veeder property include Malbec and Viognier. Johnson is very enthusiastic about Hess’ Malbec, which he sees as an up and comer, especially now with Argentina making it so popular. “Malbec is like the second coming here,” says Johnson. “Early in my career, Bordeaux reds were Cabernet Sauvignon, Merlot and Cabernet Franc. Then in 1991, a French investment group planted a vineyard that included all five Bordeaux blend varietals. They had extra Malbec and called Hess—it turned out to be absolute rocket fuel. It really turned my head. I researched it extensively, and now it’s planted on all our ranches.” The one I tried has pepper, tobacco and cedar on the palate—a spicy, juicy number for sure. Hess also has a renowned contemporary art museum featuring works from owner Donald Hess’ personal collection. “I fell in love with this spot,” says LaTour Vineyards owner Tom LaTour, former CEO of Kimpton Hotels and Restaurants (and now owner of LaTour Signature Group). He grows Syrah, Pinot Noir and Chardonnay on the Mt. 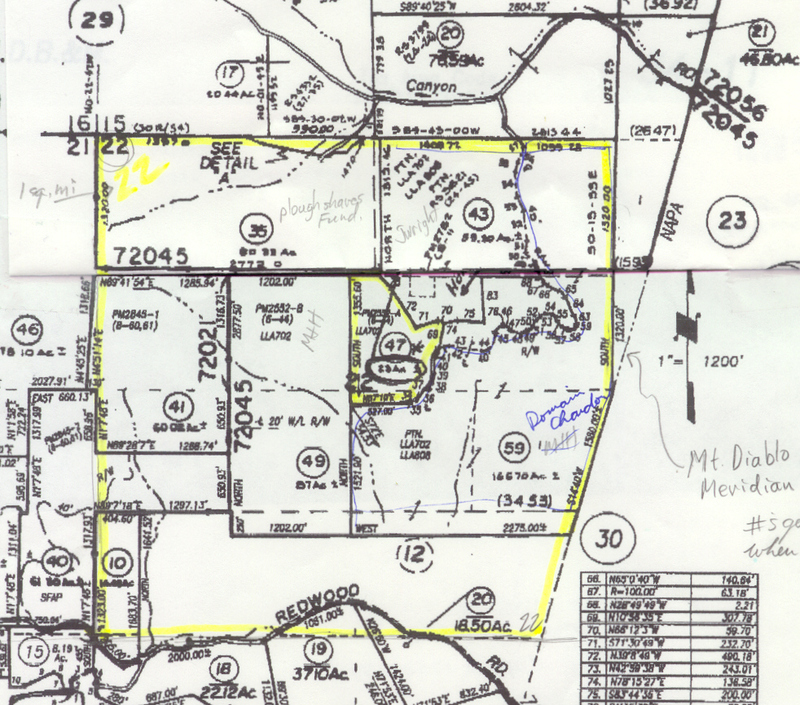 Veeder property he purchased from Donald Harmes in 1999. “The vineyard is very peaceful.” It’s so peaceful there’s even a resident ceramics artist, Lynn Mahon (www.lynnmahon.com). LaTour’s dreams of making his own wine began to seed during his years in hospitality, which included exposure to wine and the winery lifestyle. And the more he worked in the industry, the further his dream to make his own wine developed. His Chardonnay style reflects his “personal taste expressed to others: Big, bold, buttery.” Michael Terrian is winemaker (he’s also the winemaker at Hanzell) and Tom Prentice is viticulturist. LaTour uses half his grapes and sells the other half. 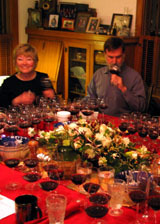 In 2008, the winery produced 1,000 cases of Chardonnay and 800 cases of Syrah, as well as some Oregon Pinot Noir and Howell Mountain Cabernet Sauvignon. LaTour’s wife Barbara does sales and marketing (“the hard stuff”), while he’s more involved in the agriculture and winemaking. Their goal is to eventually produce about 5,000 cases of wine annually. His Syrah vineyard is propagated budwood from Australia’s Barossa Valley. When it hits your palate it’s cool, with meaty characteristics, white pepper and nice acidity. Blended with only 1 percent Viognier, “this wine is particularly good with red meat,” says LaTour. Prior to purchasing his vineyard in 2000, Mark Holler worked for Intel as a device physicist in semiconductors. Since founding Camalie Vineyards, Holler has applied his understanding of data analysis in interpreting the latest viticulture research results. “UC Davis is a great resource,” he says. “My knowledge is fresh, but I value my vineyard manager’s 30 years’ experience on Mt. Veeder as much as the latest research.” As part of his approach, Holler developed Camalie Networks, a wireless vineyard monitor mainly used for soil moisture monitoring. Holler only makes about 80 cases of wine for family and friends. The rest of his grapes are sold, mostly to Sherwin Family Vineyards. His vineyard is made up of 95 percent Cabernet Sauvignon (French clones), a small block of the “happiest Merlot on the planet,” and some Carmenere (not commonly grown outside of Chile), a “funny grape—vegetative but when blended with the other two, it’s quite good.” The one I tried had an herbaceous nose followed by minerals and dark fruit on the palate. His Cabernets are deep, dark and masculine—just as one would expect Mt. Veeder Cabernet to be. Mt. Veeder is a place with an incredible history, but also with a future that’s equally as dynamic, thanks to the characters who make it their home and place of work. And it’s not a place you’re just going to stumble upon. Most of its wineries, with the exception of Hess, are open by appointment only. Then again, things that take some extra effort are so often well worth it. Just like Mt. Veeder wine. This is a list of wineries and vineyards that produce grapes and/or wine from Mt. Veeder properties. ever-changing. If there’s an omission, please contact us at jfadda@northbaybiz.com and we’ll add it online.